Thank you for choosing to contract with 50 Floor. 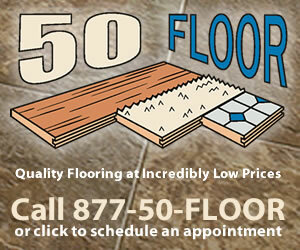 We appreciate you giving us the opportunity to install new flooring in your home. I do understand that you have communicated with the general manager regarding your concerns and now your concerns are resolved. Should you have any other concerns or questions, please do not hesitate to give our customer service department a call. You are also welcome to speak directly with me should you choose to do so. 50 floors instated a carpet grade below than what I paid for, been trying to address with company here in Orlando just to get a run around!!! Called the salesman, empty promises....he even texted me back thinking he was texting his dispatch and insulted me!! He was saying I was screaming at him!! I haven't begun to scream yet!! But it's coming!!! If David was on a sales call, he would have been here the next day!!! Horrible customer service, unwilling to work with me, they even broke my closet door and fought with me about it!! There's more a lot more, don't think I have enough letters!!! Stay away from this company!!!!! Reason of review: All the above!!! Installed wrong grade of carpet for the price of the better carpet!!. I didn't like: Nightmare, Employees, Lie about the contract, Deplorable customer service, Unsatisfied. Review #904570 is a subjective opinion of User904570.